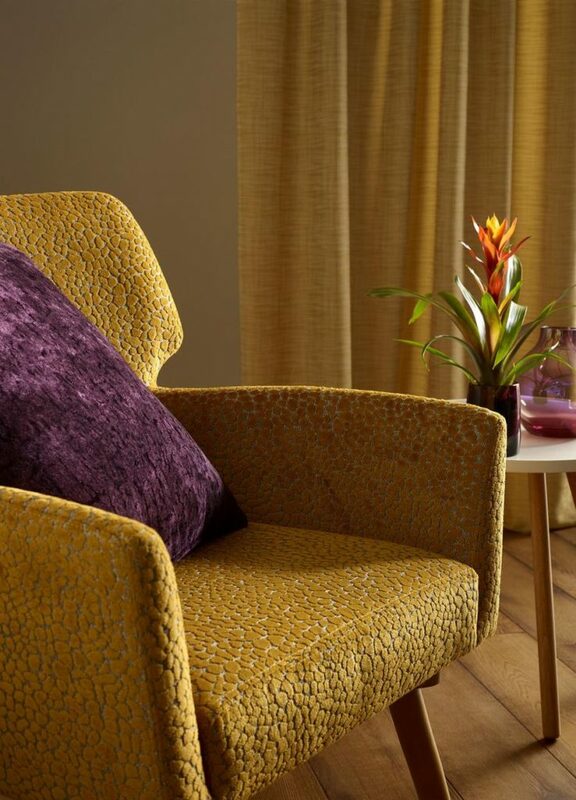 Sekers: Contract furnishing fabrics supplier who will showcase a selection of hospitality fabric ranges. New to the Sleep + Eat event will be the Copernicus collection, a versatile collection of two woven velvets. Chelsom’s products. Left to right: Icicle, Radar, and Roma. 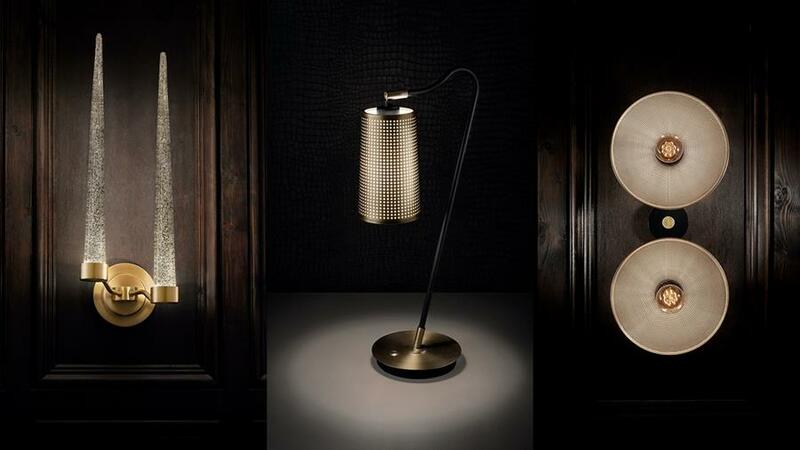 Chelsom: Will show products from their latest collection ‘Edition 26’, a collection that promises to be a truly eclectic lighting experience. Dominating this collections design is an array of brass tones, textured Venetian coloured glass and varying marble finishes. All available with LED light sources to accommodate the latest developments in technology and energy efficiency. 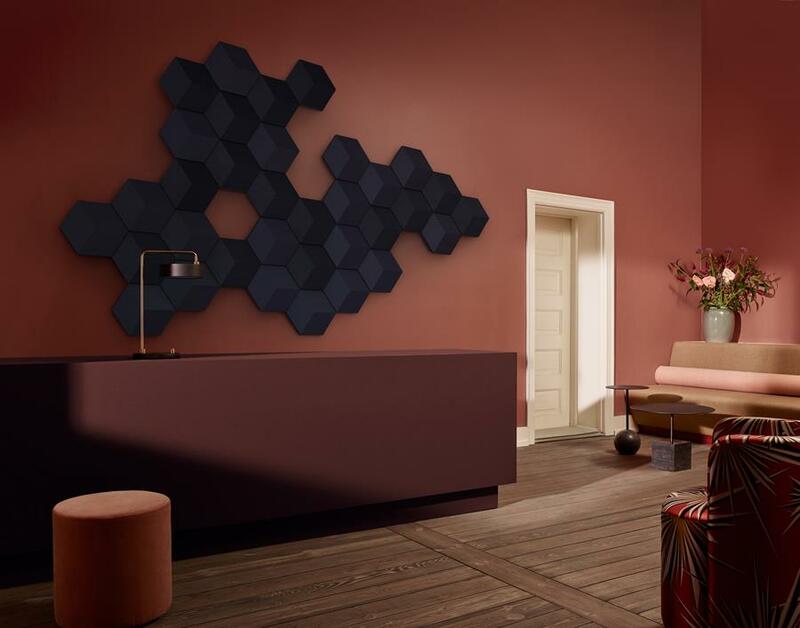 Bang & Olufsen: The second time the Danish company have exhibited at the event. They will bring along a range of ultra HD Tv’s for the hospitality sector, public area audio solutions and guest room Bluetooth speakers. 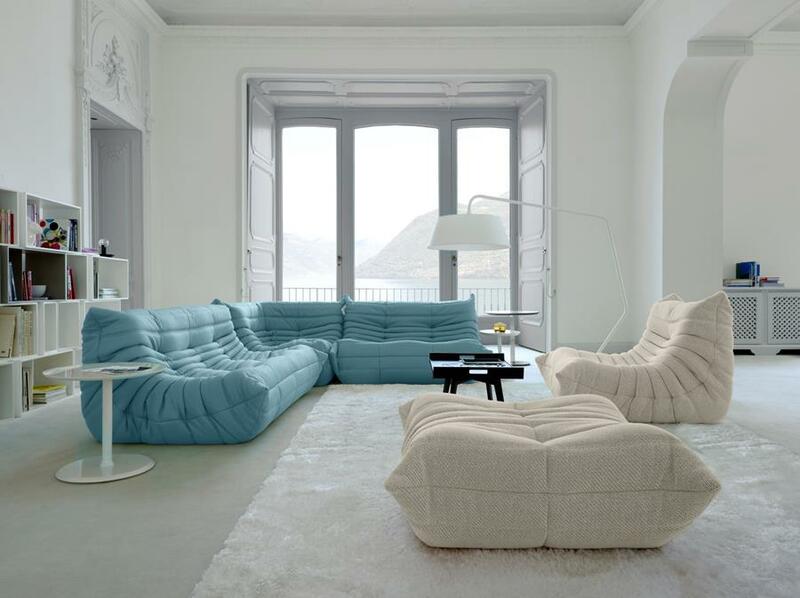 Ligne Roset: The brand will be presenting their signature sofa range, each created by a different designer. With these sofas being described with such whimsicle imagination such as ‘a tube of toothpaste folded over on itself like a stovepipe and closed at both ends’, the collection promises to ignight the imagination. Kartell by Laufen is proud to take part in London Design Festival, which returns for the 16th year in 2018 with the aim of celebrating and promoting the City as the design capital of the world. The unmissable gathering, attended by global members of the press, the brands showcased, for the first time in London, an artistic museum-like installation at the Kartell flagship store on Brompton Road, Chelsea. Signed by the delightful designers Ludovica + Roberto Palomba, it is an engaging, exploratory exercise on washbasins that combines innovation and research: a voyage of suggestions, in which East really does meets West in an atmosphere of forceful emotional impact. Starting with the colors of food and the objects that encourage shared relations on the table, Ludovica + Roberto Palomba present a new concept study on shapes: iconic forms that range from rounded profiles to more rigorous, squared shapes, even futuristic at times, set apart by unexpected shades of red, green and brown, suggesting unique shadows and contrasts. 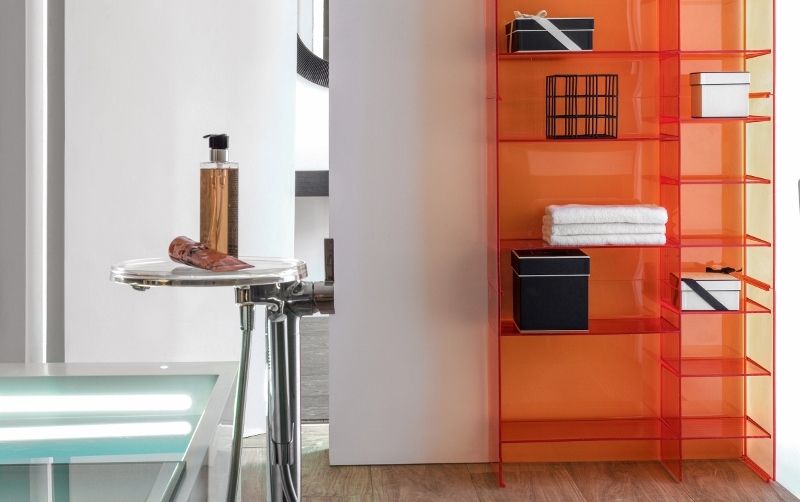 The space over the raised platform is separated by fabric panels in an orange hue from the palette of Le Corbusier – a tribute to the tone that best represents the birth of the whole Kartell by Laufen project. A second area of the showroom offers visitors a full immersion in the Kartell by Laufen universe of the bathroom, by showcasing the decorated freestanding washbasin, the bathtub with oval shape and accessories in the latest shades of emerald green and powder pink. Also on display is a range of taps and fittings, available in different finishes in order to meet all taste requirements. 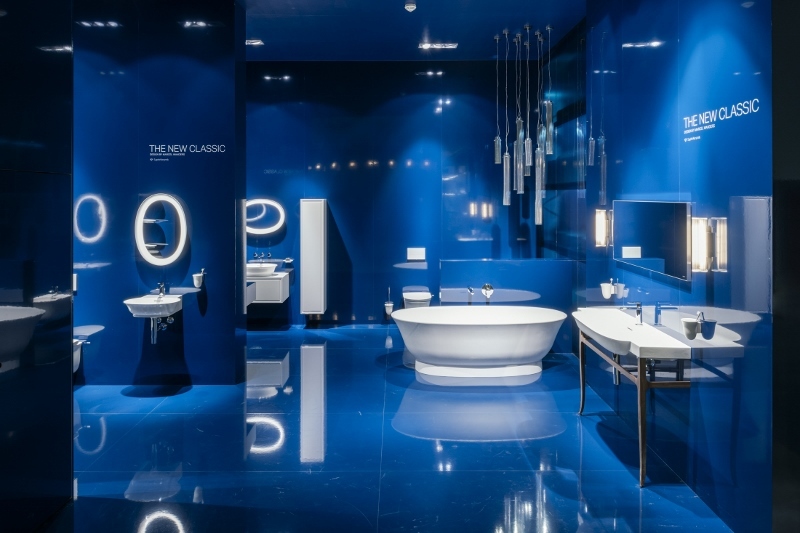 During London Design Festival, the Kartell flagship store takes on a noble atmosphere: the bathroom becomes a space of expression in which every detail has been carefully refined to offer diversified and personalised solutions. 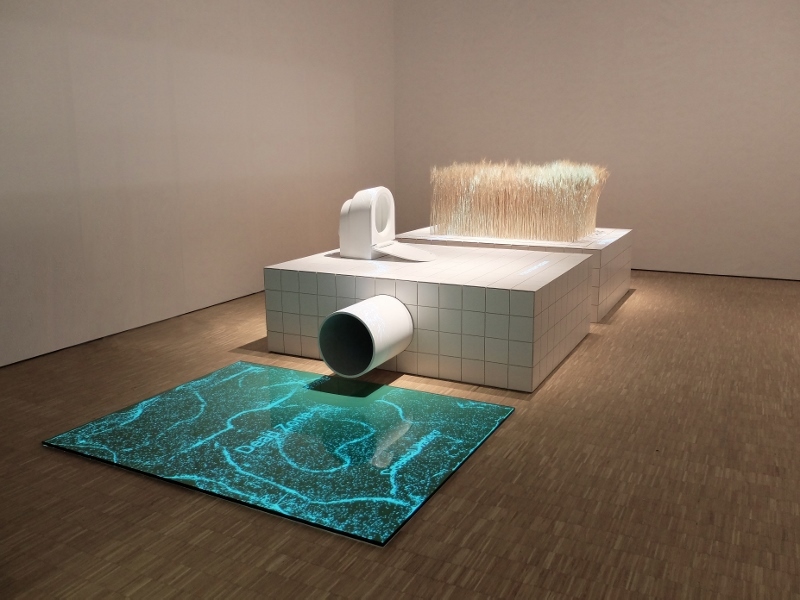 A new interpretation of the needs of modern everyday life, where the relationship among domestic environment and bathroom focuses on aspects linked not only to the functional dimension, but also to the emotional sphere. 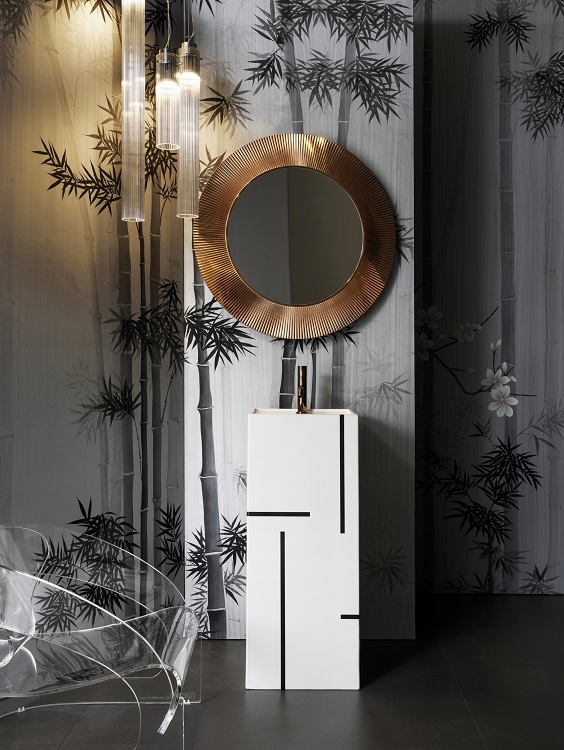 A rediscovery of personal wellbeing and care for the body, in perfect Kartell by Laufen style. No stranger to collaboration, Kartell by Laufen has been working with a range of prominent architects and interior design studios to deliver worldwide bespoke projects of all shapes and sizes. Thanks to departments in the two companies specialising in the contract sector, the brand Kartell by Laufen is able to offer solutions that accommodate even the most complex requirements spanning space, comfort and exclusivity. Amongst high-end hotels and exclusive resorts, the portfolio of Kartell by Laufen comprises the bathroom furnishing of Hobo Hotel in Stockholm, the Spa at Pacai Hotel in Vilnius (Lithuania), 25hours Hotel The Circle in Cologne, Innside Hotel by Melià in New York, Kimpton Palomar Hotel in Washington DC, The Park Lane Hotel in Hong Kong or the Nobu in London, to mention but a few. 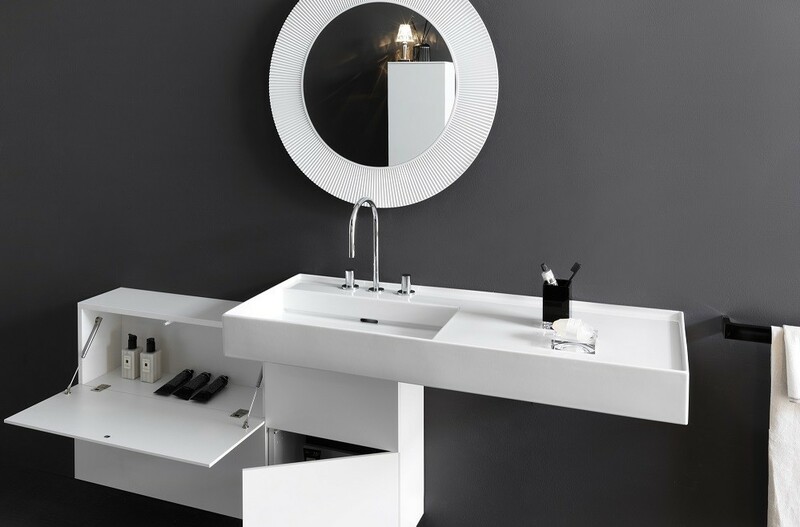 The new BASE bathroom furniture set from Laufen is the essential accompaniment for today’s bathroom. Providing essential storage for day to day items including towels, toiletries and other bathroom utensils, the furniture range helps create an efficient and organised result. Slim and coordinated to the bathroom ceramics, the new Base range of bathroom furniture offers an ideal solution for every size of bathroom. Base is designed to offer exceptionally high quality whilst ensuring the range is also excellent value for money. Laufen’s new range gives a timeless, minimalist look, in the best Swiss design tradition. The six standard finishes available provide the consumer with a range of colour options that embellish and enhance any bathroom design. The light and dark wood veneer finishes bring a natural warmth to the room. Thanks to the three-dimensional wood-like structure, the surfaces have a high-quality finish and give the appearance of real wood. With impact and scratch resistant surfaces, as well as being splash-proof and easy to clean, they are also suitable for tough everyday use in the family bathroom. 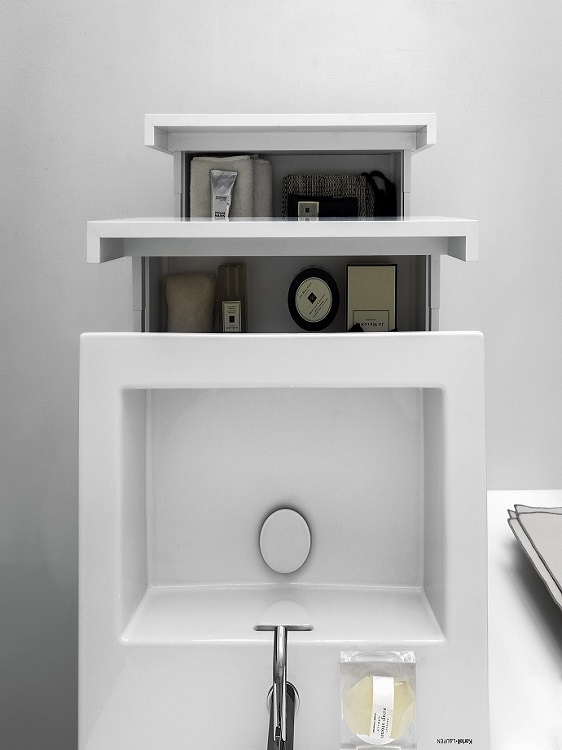 Practicality is a key consideration and the smart internal drawer compartment made of transparent plastic is included in the top drawer of the vanity units, unique to Laufen. The removable tidy feature is ideal for storage in a clear and easily accessible way, and is also easy to remove for cleaning. The Base range includes vanity units for the Val and Laufen Pro S bathroom collections, together with prefabricated Pro S slim washbasin packs. The vanity units for Laufen’s Pro S and Val washbasins have been fitted with elegant narrow handles in aluminium while the vanity units for the Pro S slim washbasins, are finished flush with the front of the furniture and come without handles to feature softclose drawers. There are matching medium and tall cabinets available with a matching laundry basket is also available for all versions at 335mm deep. 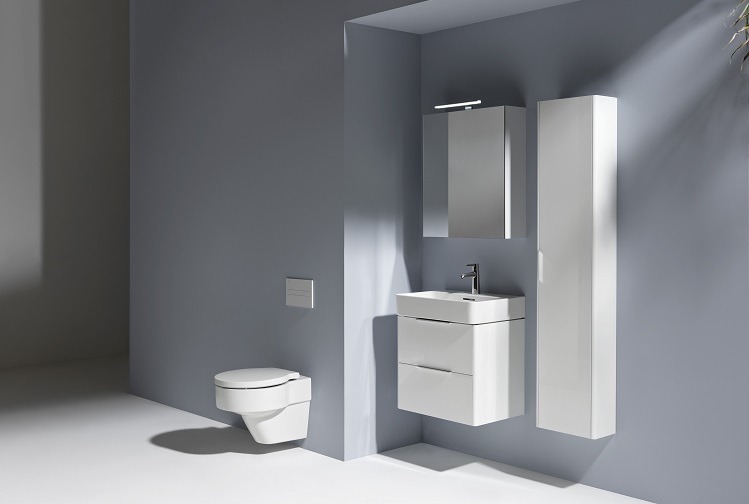 For individual bathroom scenarios Laufen also offers the option of the 335mm-deep single-door tall cabinet in a bespoke width between 250 and 450mm, and up to a maximum height of 1650mm, allowing bathroom planners additional options when planning challenging bathrooms. Another practical feature is a small, open-sided free-hanging mirror cabinet element with two trays. It brings additional mirror surfaces and further easily-accessible storage space into the bathroom. 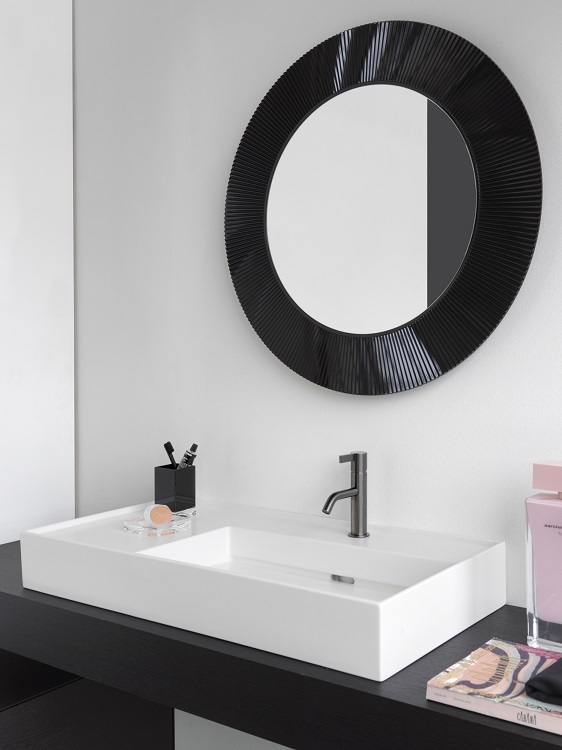 In addition, there are also four sizes of mirror cabinets available in the Base range, which are coordinated to the washbasin widths, offering an ideal complement and the perfect finishing touch. 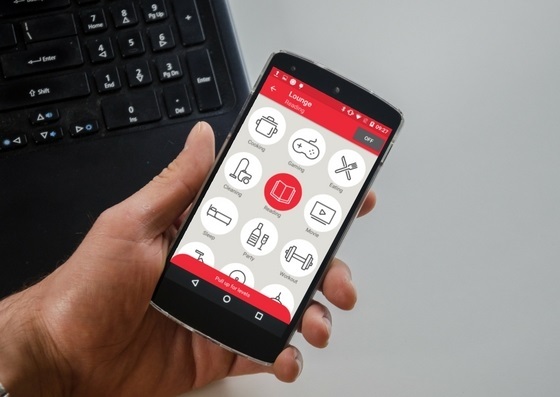 Wandsworth Controls, a division of Wandsworth Electrical and who bring intelligence to Wandsworths beautiful light switches, has released a lighting control app for Android devices which enables you to control your lights from your phone or other smart Android devices. This is the latest, most stylish and advanced smart phone app for Wandsworth Lighting Control. Designed to provide remote access, the Wandsworth Lighting Controller (WLC) has been enhanced with new stylish icons to enable more scene settings and control. Within the app you can change levels of circuits within scenes, set timed events, set the lights to turn on at dusk and off at dawn. Lighting Control is no longer a nice to have or a design element for the future but a requirement and requisite for now. Wandsworth Control was developed following research and analysis of the market with the conclusion that lighting control offerings did not meet the high level of design and quality at the front end interface. With our 100 years of experience in handcrafting designer light switches, Wandsworth intelligent lighting control system ensures those needs are met. The ever-growing use of smartphones and other smart devices has moved lighting control to a new level and Wandsworth’s latest app version brings the latest lighting control technology into the palm of the hand. With its stylish design and multiple control features, the Android app continues Wandsworth Controls ability to combine beautiful designer light switches and scene plates with intelligent, cutting edge lighting control technology. 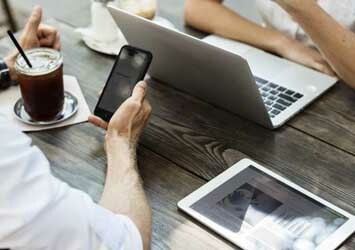 The latest design version is only available on Android devices and will soon be available on iOS but the app and its multiple features are available across both platforms. They can be downloaded via the appropriate devices app stores. Contact Wandsworth to discuss their lighting control capabilities, they are happy to help and will walk you through every step and ensure your lighting control system is exactly what you want. Kartell by Laufen, designed by Ludovica and Roberto Palomba and launched in 2013, is a project based on the fusion of the best characteristics of two companies: Kartell for its originality and design of plastic objects, and Laufen Bathrooms for its quality and rigor in the field of ceramics. From the outset the collection has focused on maximum flexibility and versatility, meeting the requirements of many different tastes. Today the range of offerings has expanded with new proposals and moods, with the introduction of a completely new series of slim washbasins and a range extension of the countertop washbasins together with new colours for the finishing of the furniture in order to address an even wider audience. One constant of the Kartell by Laufen project is the very high quality of the plastics and ceramics, and in particular of SaphirKeramik, the innovative ceramic material developed by Laufen, which has revolutionised the world of the bath due to its capacity to combine lightness, strength and slimness, thanks to an innovative formula enriched with corundum. 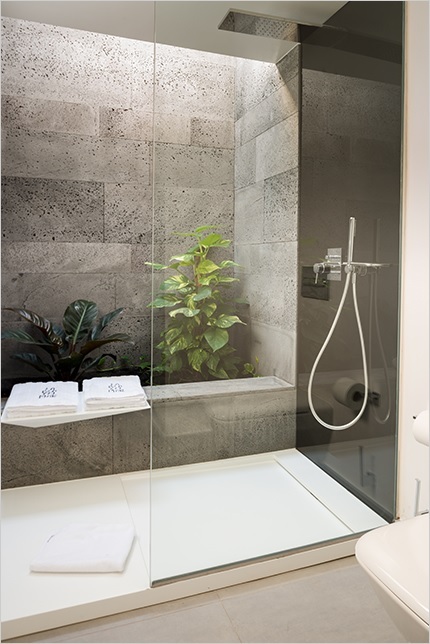 Now a benchmark among Spain’s most renowned architects and interior designers, the boutique hotel La Isla y el Mar in Lanzarote, part of the Martínez Hermanos Group, has chosen the design, quality and exclusivity of Laufen’s products for its bathrooms. 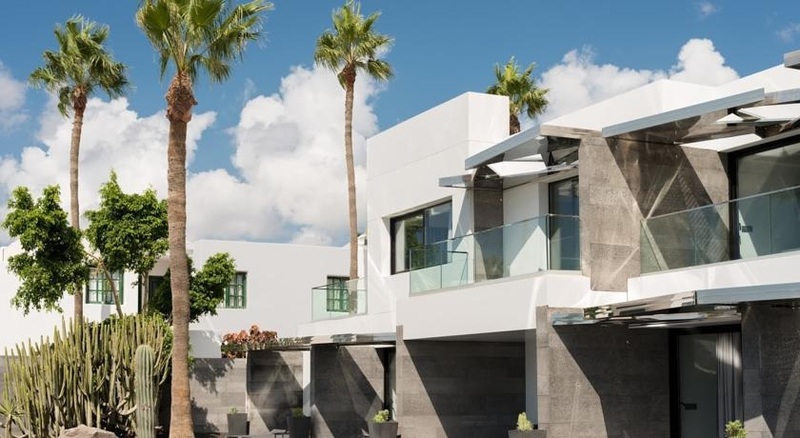 Situated in the town harbour of Porto del Carmen and built by the architect José María Pérez Sánchez, using the island’s natural materials – such as volcanic stone – the design of this 4-star hotel manages to perfectly combine art and modernity, thereby achieving an intimate atmosphere. Its 81 suites are equipped with exclusive, custom-made basins from Laufen, especially made for this project in Sentec – a solid surface material manufactured by Laufen, which has exceptional physical and microbial durability and is particularly suitable for hotels and public buildings delivering unique features that contribute to creating an elegant and avant-garde atmosphere which emanates throughout the hotel. The architect thus emphasizes the challenge of finding a piece that unites the high demands of its users. “A large surface for the customer’s items, a separate space for the amenities, and sufficient interior space. Laufen gave us the opportunity to make a basin for the hotel La Isla y el Mar with a material that could be adapted to the project,” he added. Sentec is a material that is unique, highly robust and recyclable. Furthermore, all the bathrooms of La Isla y el Mar have the distinctive Kartell by Laufen design with slim shower trays, also made of Sentec, together with the orange-coloured accessories from the same collection, endowing them with the chic and sophisticated touch characteristic of Kartell by Laufen. Implemented by Ludovica and Roberto Palomba (ps+a, Milan), the collection unites two signatures of international standing – Laufen and Kartell. Since it was launched nearly three years ago, it has been successfully presented all over the world with more than 500 points of sale in over 40 countries. The first single-brand shop of this collection was inaugurated last year in Milan and was a great success. The bathrooms of the boutique hotel are complemented by a WC from Laufen’s Palace collection. Realised by the designer Andreas Dimitriadis (platinum design), they pay tribute to the outstanding properties of ceramics. The WCs of this series are ergonomically shaped and have a concealed mounting for a sophisticated finish. A commitment to sustainable development and the protection of the environment is another one of the values shared by Laufen and the La Isla y el Mar hotel. 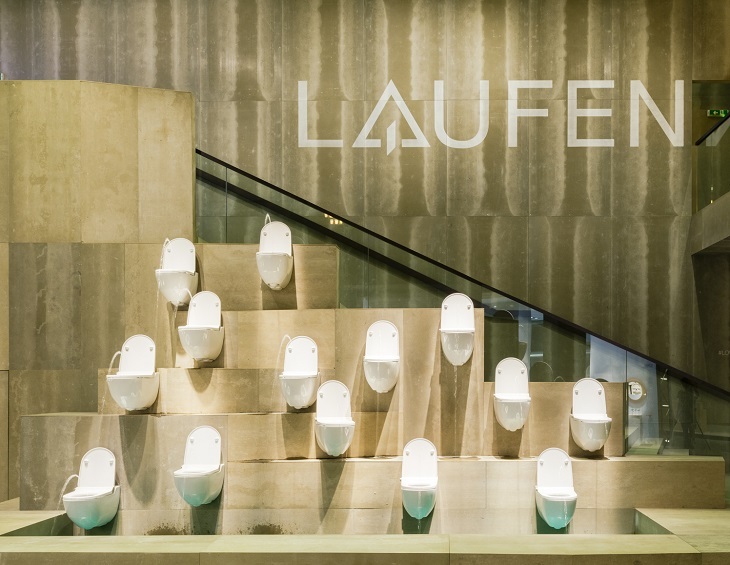 For Laufen, which offers solutions that, among other things, contribute to saving water and energy, it is a priority to be involved in projects designed to protect the environment, and the cooperation between this Swiss company and this new hotel is one example of this. The Swiss bathroom specialist Laufen continues to innovate, now presenting Sentec, a mineral material which can be used for bathtubs and shower trays, as well as for the realisation of individual designs created by architects or designers. Sentec is a new mineral composite material from Laufen, combining a multitude of product properties, which make the material predestined for use in bathrooms. The name, which is a combination of the words ‘sensual’ and ‘technical’, perfectly captures the advantages of the material: Since Sentec is polished again and again in multiple work sequences, its velvety shiny surface feels warm and pleasant to the touch – a real pleasure for the skin when bathing, for example. Under the shower, too, the surface demonstrates its strengths with the material’s non-slip properties, which give the user a secure feeling. Optically Sentec provides a sensual impression, because it can be produced in numerous colour variations – although until now Laufen has concentrated completely on white in its collections, for example Val, Ino, Il Bagno Alessi One, Kartell by Laufen and the Palomba Collection. In addition, the Sentec surface is anti-bacterial, easy-to-clean, resistant to chemicals, UV-resistant and robust even when temperatures vary greatly. Angular corners and demanding shapes are possible. The technical advantages of Sentec become clear when we take a look at the production of the material: During a fast production process a homogeneous mixture of different minerals is cast in a mould under high pressure, and then heated in a furnace until it hardens. 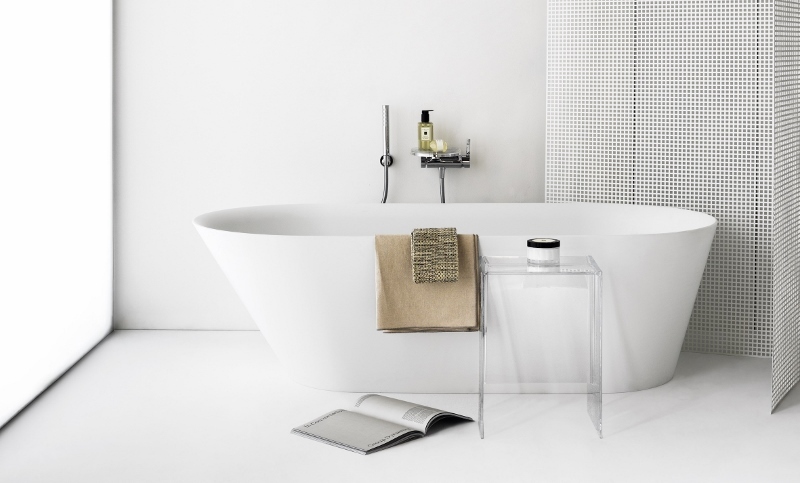 Thus even sharp-angled corners and demanding shapes without joints, which would be impossible in ceramics, are possible – for example for freestanding bathtubs. 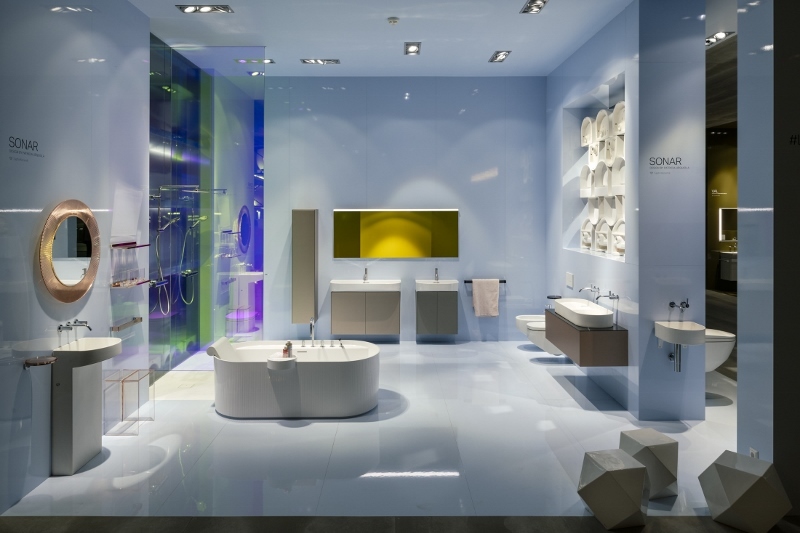 A further advantage of Sentec is that the bathtub has a single wall, and can be created in one casting, instead of with a double wall as is usual in the case of bathtubs produced using conventional materials. The Sentec bathtubs from Laufen, for example from the new Val or Ino bathroom collections, thus weigh far less, yet feature an integrated overflow and are installed in a conventional way. 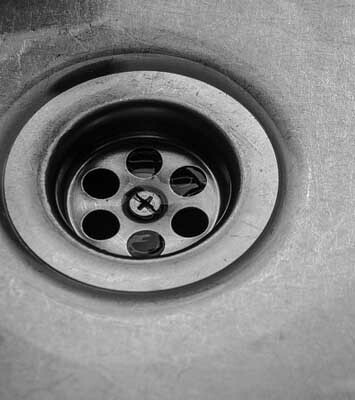 A further advantage of Sentec is the possibility of reworking products made of the material at a later date: Thus surfaces made of the material can be cut to size individually, or the fitter can make holes for faucets using conventional tools. With the assistance of a repair kit even light damage, scratches or stains can easily be repaired.